Figured that I'd put a quick review of this garage here. As a somewhat new Lotus owner, I'd been searching for a place that could be trusted to maintain the Elan; I'm unlikely to do much work on it myself, and would much rather pay someone else to do it. I'm not equipped to work on cars in terms of tools, space, knowledge, time, nor inclination. SWLC was recommended to me as a decent place, and despite it being a three hour drive from where I live, I took the car to see them earlier this week. From the very first moment I contacted them via email to ask about a basic service and getting the geometry reset, I was impressed. Immediate response, lots of info, sensible price estimates, and the sense that they would be more than happy to work on my car. Unlike my more local Lotus garage, where emails were never returned, phone calls unanswered, and phone messages left ignored, SWLC was on the ball when it came to customer service. Dropped the car off Tuesday morning, met a few of the people who worked there (who all made sure they said hello to me and introduced themselves as they walked past - and little stuff like that matters, because it shows that they're interested in building up relationships with their customers), and was given a sturdy loaner car to get me home again. A really friendly bunch, and some of the nicest people I've ever met in a garage. No feeling whatsoever that my little Elan was an inconvenience that would stop them working on more expensive vehicles or more important projects. 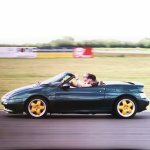 It was as if my Elan was as special and unique to them as some of the cars sitting around that were worth ten times as much, and that it would be treated with as much care. Anyway, car was ready the next day, so I drove back down to pick it up. Everything that had been done was fully explained to me, and the invoice what pretty much what I'd expected to pay. No unpleasant surprises whatsoever. And the car now drives stunningly well. It was pretty good before, but the geometry work that was done by SWLC has turned it up to eleven. Quality workmanship, and in my opinion, well worth paying for. Overall, a really pleasant experience from start to finish. Highly recommended to anybody else who doesn't particularly relish the thought of doing their own maintenance, and they'll be my garage of choice moving forward. Nice work, nice people, and somewhere I'm happy to spend my Lotus maintenance money. James (from SWL) is an M100 owner himself and is a great guy - always available for a chat if you need it. As a company they have owned/worked on many Elans (and others!) and built up quite a stock of parts/knowledge. I have used them for such in the past, but never used them for service (although I know others who have, and have been equaly impressed). Clemo was going there this week - you may even have seen a bloke with a 'Fila' bucket hat wondering about (he goes nowhere without it!) - and if he'd known you were going down his way, I'm sure he'd have put the kettle on for you. I may have to admit defeat and take my car to someone that knows what they are doing. Google says they are 106 miles from me, so not to bad really. Indeed they have a good reputation on TLF too. But I never had the opportunity to buy something from them yet. Bern wrote: That's good to know. But have had dealings with them on several occasions. Nothing but a glowing reputation from them on my side. As already said. they are very helpful people. As for the 10% rebate, I am talking about SWL. SJS doesn't offer any rebate, but he has plenty of parts which may be hard to obtain elsewhere, and he is very helpful and responsive in my experience. And I have made quite a few orders from him already! ECC may i ask what you paid for that service ? I do use STEVE at SJ's for spare parts as he has stacks of bits and is a touch close to my house. Both are very decent knowledgeable Elan folk. clemo wrote: a touch close to my house. That is so very unfair!! For a LOT of owners!